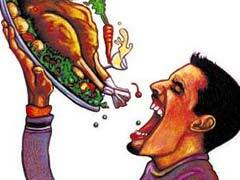 Binge or compulsive eating is one of the common eating disorders that usually affects obese or overweight people. Sometimes, a normal weight person, who is an emotional eater, can also fall prey to this borderline mental condition. 1. In the US, 2% of the population, which accounts to 4 million people, is affected by the disorder and cannot stop binge eating. 3.5 % of women and 2% of men affected by the illness, over a course of a lifetime. 2. Compulsive eating disorder can persist for more than 14 years, with only 7% of the affected people having their problem resolved after the first year. 3. Compulsive eater is at a high risk of developing chronic conditions such high blood pressure, diabetes, certain types of cancers and abnormal cholesterol levels when compared to a similar weight person who is not a binge eater. 4. Apart from psychological reasons, biology and genetics can play major role in a person developing the illness. Binge eating often affects several people in a family. According to a study, people are twice as likely to binge eat if they have a relative who suffers from the disorder. 5. About 57% of the men and 28% of the women with compulsive eating disorder suffer also from some kind of substance abuse disorder. 6. The average cost of treating eating disorder patients in the US is currently is $6 billion per year. Global cost for anti-psychotic medication is about $7 billion per year. 7. It is predicted that after about six years, only a little more than half the people who get intensive compulsive eating treatment, show significant improvement in their symptoms. About 6% show poor outcome and 1% may actually die during the period. What is shocking and scary is that only 1 person in every 10 people with eating disorders actually seek help. Often, people with compulsive eating disorder are on some kind of drastic weight loss programs and there is a high chance that the lost weight will be regained quickly. Comprehensive programs that focus on glycemic index weight loss diet plans are shown to be effective for healthy weight loss and heart health.